An increase in demand for electricity results in demand for new methods of energy production. Renewable energy sources are more and more popular. Their advantage is low energy generation cost and low level of pollution. One of the most popular and ecological methods of electricity production are wind farms. The iMod industrial computer is widely used in monitoring and control of wind turbines and wind farms operation. Wind farms are located in open space and convert kinetic energy of the wind into mechanical energy, which is transferred into electricity by a generator. Wind farms are build both inland and offshore - the latter can produce more electricity in shorter time due to stronger winds. 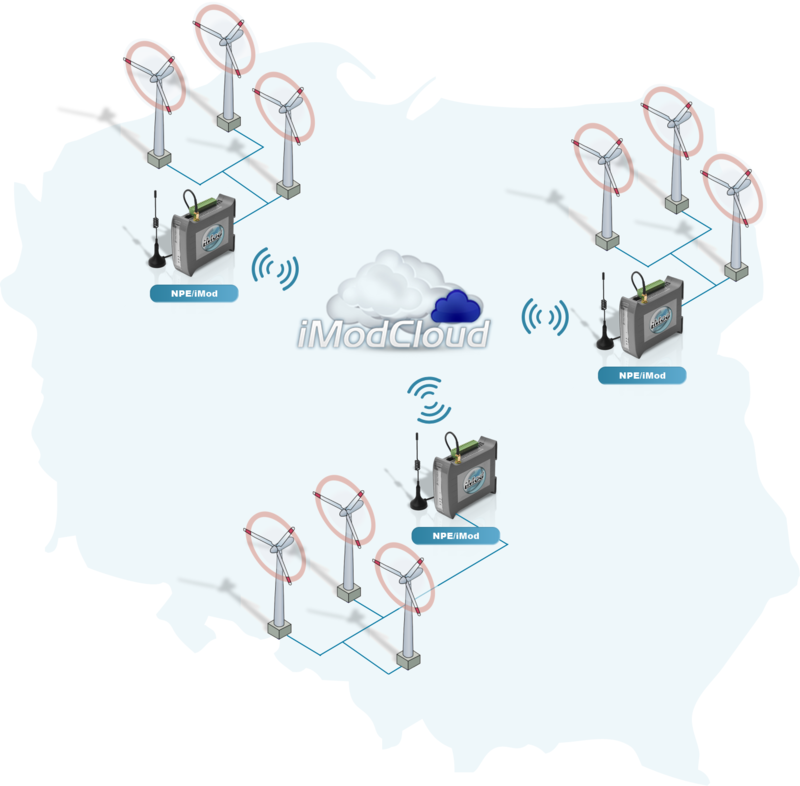 The iMod industrial PC allows you to save data into internal memory, SD card or data base (on the device or external) - a user can monitor wind turbine parameters in real-time (or periodically). Data can be transferred by radio with the use of external radio modems or directly with the use of a built-in GPRS/3G modem. 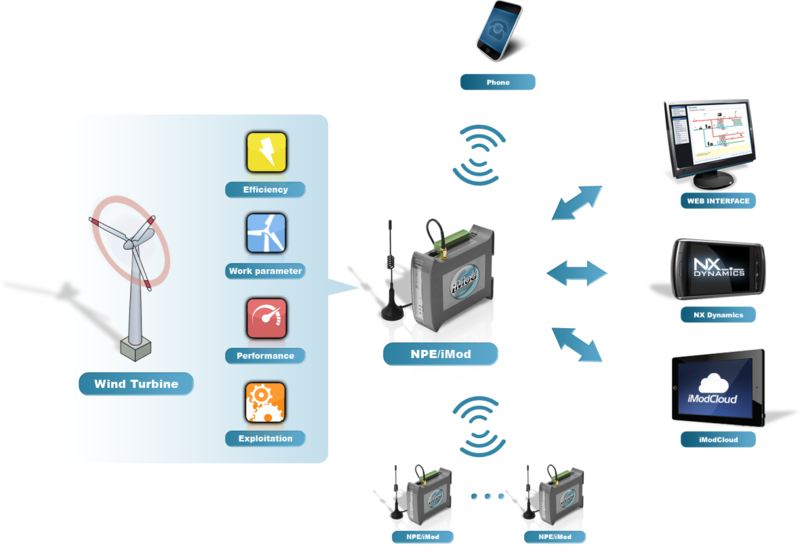 In case of wind farms containing a huge number of wind turbines, ZigBee technology might be the best solution - such a network is characterized by low energy consumption and allows sending information over long distances. ZigBee network topology is perfect for these solutions - each iMod unit with a built-in ZigBee modem operates as a receiver and transmitter sending information further to a central point of a system. The SQL data base and built-in Apache server allows you to create dedicated websites. With the use of 3G data transmission technology and the TCP/IP protocol, a system administrator can control all the turbine parameters via any website in real-time. The iModCloud service enables you to manage your devices via the Internet - it provides you with access to selected parameters of all system devices. The iModCloud solution is based on the VPNs - increases security of transferred data. With iModCloud you can manage any number of devices distributed over an area, as if they were in one network. This is why you can change operating parameters of all your turbines (e.g. you can disconnect them if a hurricane is approaching) with a single click. You can do that with any device providing access to the Internet - e.g. smartphone or tablet. iMod can optimize operation of the whole turbine system (based on data analysis) in order to maximise efficiency, for example, control of a servomechanism responsible for directing and setting a proper angle of a turbine depending on a wind direction. The logic might be implemented due to PLC functionality and with properly selected sensors, connected to the iMod module. This increases performance and electrical efficiency of a turbine. Error reporting and location of places where errors occurred is another important function - particularly in extensive wind farms. Built-in GPS module allows sending alarms with a precise location of the fault. Alarms can be send to predefined recipients via SMS or email - such a solution shortens the time necessary to restore proper functioning of a system. You can predict many factors reducing performance - this helps to reduce efficiency loss. The iMod module optimizes cost and increases turbine performance. You have full control over the system.